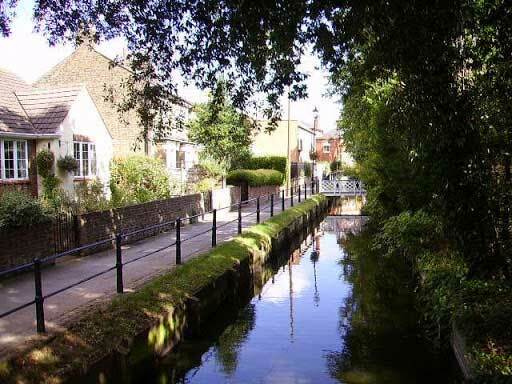 At the end of Gentleman's Row, follow the path on foot and cross the New River on a small bridge. Turn right and walk along the river to the Crown and Horseshoes pub. Re-cross the river and follow the right-hand side to the next bridge, where you cross back to the left-hand side to join a road (Parsonage Gardens). The New River is a feature of the Enfield landscape. Sir Hugh Myddelton's project to bring water 38 miles from Amwell Springs in Hertfordshire through Enfield to Islington was completed in 1613. In 1890 the portion of the New River around Enfield village was piped underground, thereby making this stretch redundant. It was saved from being filled in by a public campaign to preserve it for its ornamental value and it is essentially a linear lake. With the aid of a Heritage Lottery Fund grant of £1.8 million in 1997, the New River Loop Restoration Project has since 1998 restored the historic watercourse, listed bridges and railings and reinstated the timber banks. Take the first right (Riverside Gardens), at the end of which you turn right into Chase Side Avenue. Follow this road round the bend to the left and then turn right into Parsonage Lane. After the signal-controlled junction with Baker Street, take the next turning left into Churchbury Lane and follow it for about 700 metres. After passing Chace Community School on the left, take the second right (Canonbury Road). Follow the road round the bend to the left into Inverness Avenue. At the busy Myddelton Avenue, turn left and right into Hallside Road. Since the entrance to this road has been blocked, you may wish to walk across to it, using the refuge. Cross Russell Road into Old Forge Road, following the signpost for Forty Hall. At the end, turn half right into Forty Hill. The entrance to Forty Hall is on the left after about 350 metres. After entering the grounds of Forty Hall, follow the drive in an anticlockwise direction, passing a car park on the right and enjoying a view of the Hall on the left across the lake. Refreshments and toilets are available in front of the Hall. In 1624 Sir Nicholas Rainton, a wealthy haberdasher and later Lord Mayor of London, purchased land in the area. Between 1629 and 1636, he built Forty Hall at the top of the hill, south of the medieval Elsyng Palace, which was demolished later in the 17th century. The name apparently derives from Sir Hugh Fortee, the owner prior to Sir Nicholas. 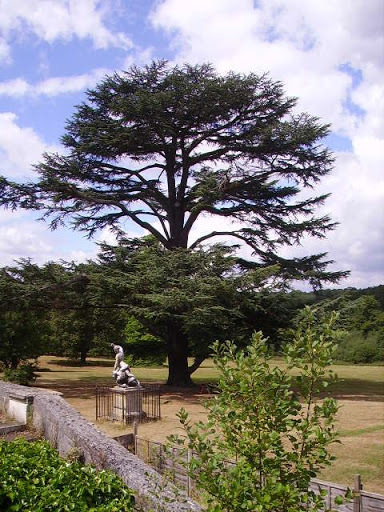 In 1951 the estate was purchased from Derek Parker Bowles by Enfield Urban District Council, who subsequently opened the grounds to the public and in 1962 began restoring the house and outbuildings. 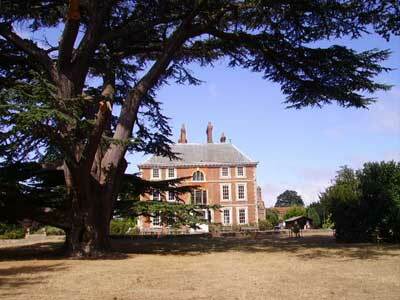 In 1966 Forty Hall was opened as a museum containing items of local historical interest. The house is surrounded by four hectares of ornamental grounds, the fragmentary remains of the 17th-century garden overlaid with 18th-century and later developments. Return to the road (Forty Hill) and turn left. The entrance to Myddelton House (entry now free) is about 800 metres further on, on the left. 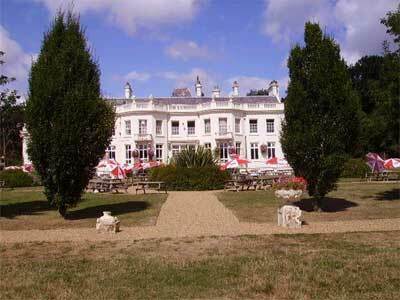 Myddelton House, named after the architect of the New River, Sir Hugh Myddelton, was built in 1818 by George Ferry and John Wallen for Henry Carrington Bowles, the last Governor of the New River Company, replacing an earlier Elizabethan house. Edward Augustus Bowles (b. 1865) lived here and, from the 1890s, was largely responsible for creating the magnificent gardens, although the overall design, paths and much of the structural planting pre-dates Bowles' work. A member of the Royal Horticultural Society Council from 1908, and vice president from 1926, Bowles has been described as ‘the greatest amateur gardener of this country, and the most distinguished botanist and horticulturist serving the Royal Horticultural Society’. After Bowles' death in 1954, the gardens and house were transferred to the Royal Free Hospital School of Medicine and the University of London's School of Pharmacy. 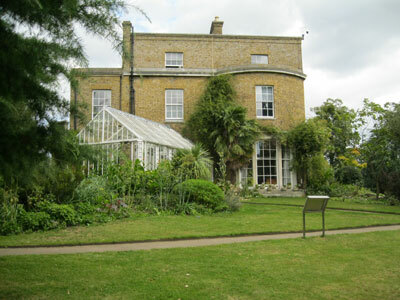 In 1968 the Lee Valley Regional Park Authority purchased the house and gardens and use Myddelton House as their headquarters, although the School of Pharmacy and the Royal Free Hospital retained parts of the estate. From Bulls Cross, follow the road around the bend to the left into Whitewebbs Road. After about 1.4 km, you will come to the entrance to Whitewebbs Park on the left, just after the popular King and Tinker pub. To reach the house (now a pub), follow the drive to its end. 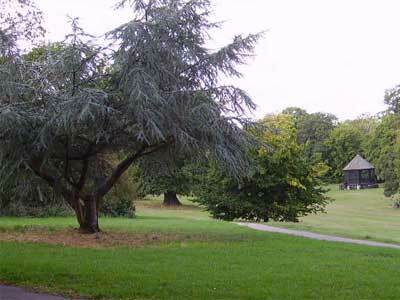 Whitewebbs Park, containing a public golf course and areas of woodland, is situated on former parkland laid out after the 1803 enclosure of the former Enfield parish common land, which had been created from Enfield Chase in 1777. The present house was built in 1791 by Dr Abraham Wilkinson, a notable agricultural improver. In 1931 the estate of approx.100 hectares was purchased by Enfield Urban District Council and Middlesex County Council and made into the public golf course, which retains much of the parkland character. Where the road bends right, after the former Fallow Buck pub, turn left into Strayfield Road. Following the direction signs for Cycle Route 12, turning left after about 600 metres. Pass under the railway and follow the road left at Rectory Farm. On reaching the main road (The Ridgeway), turn right and immediately left into Oak Avenue. At the bottom, turn right into Hadley Road. 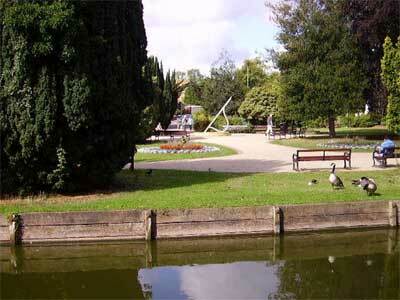 After about 1.7 km, you come to the entrance to Trent Country Park on the left. Trent Park is on land formerly part of the royal hunting forest of Enfield Chase, which in 1777 was enclosed and divided by Act of Parliament. A small part was earmarked as a miniature hunting park, the principal portion of which was granted to the King's physician Dr Richard Jebb, as a reward for saving the life of the King's brother, the Duke of Gloucester, at Trento in the South Tyrol, hence the present name of the estate. A deer park of 81 hectares and lake were laid out and in c.1777 one of the old Enfield Chase lodges was converted by Sir William Chambers into a villa known as Trent Place. The house was extended at various times and was then largely rebuilt between 1894 and 1931. Philip Sassoon, who inherited the estate in 1912, laid out the formal gardens and pleasure grounds around the house, and these contain various fine monuments and sculptures. When Sassoon's cousin Hannah Gubbay died in 1968, most of the land became a public park, Trent Country Park, which was officially opened in 1973. In 1947 the house with approx. 81 hectares of land became the Trent Park Teachers Training College, itself becoming Middlesex Polytechnic in 1974 and then Middlesex University in 1992. Turn left along the drive, passing a small café (on the right) and a column, and follow the anti-clockwise traffic system around the former Middlesex University campus. (You are advised to go round rather than under the rising barriers.) Stop at the house to enjoy the view from the terrace at the back, if it is not cordoned off. Return to the column and then back towards the house. Turn immediately sharp right into Snakes Lane, towards the Oakwood exit. Take care crossing the road humps along this road. The road ends at Bramley Lane, nearly opposite Oakwood Station. Turn left into Bramley Road, continue down Enfield Road and up Slades Hill, using the cycle track (which crosses the road a couple of times) and passing the Jolly Farmers pub on the right. At the mini roundabout, go straight ahead down Windmill Hill to reach Enfield Chase Station on the right near the bottom of the hill. Unless otherwise stated, all the parks and gardens are open during daylight hours and entrance is free. Please show consideration to other park users and walk along paths where cycling is prohibited.